The Dialogues 5 residency will conclude with an open discussion on the morning of Thursday 8 November, which will assess the importance of critical dialogue to artists in developing their practices. To mark the culmination of Mark Devereux Projects’ critical mentoring project, Dialogues 5, we will be in residence in The NewBridge Project gallery space, holding three public events that will consider the value of critique. An exhibition of new and recent artwork from the project’s participating artists – Shaun C. Badham, Holly Davey, Hannah Leighton- Boyce, Hollie Miller, and Amy & Oliver-Thomas-Irvine – will act as the catalyst for these discussions. Over four days, the artists and Mark Devereux Projects team will be working in the gallery testing out new developments within their respective practices, from materials to the methods of display. This test-bed approach will be informed by the extensive conversations between Mark Devereux Projects, the artists and their assigned curatorial mentor that have taken place throughout Dialogues 5. The results can be seen at an opening between 5.30-8pm Tuesday 6 November. Dialogues 5 is a major new project from Mark Devereux Projects providing tailored critique and mentoring for five visual artists. Selected from a national open call application process, the participating artists attended a five-day creative retreat at Clayhill Arts, Somerset, in June. The critical dialogue held before, during and after the retreat set-up curatorial mentoring between the artists and assigned mentors: Fiona Bradley (Director, Fruitmarket Gallery), David Kefford & Sarah Evans (Aid & Abet), Katie Hickman (Curator, BALTIC), Claire Mander (Director, theCoLAB) and Nathaniel Pitt (Director, Division of Labour). 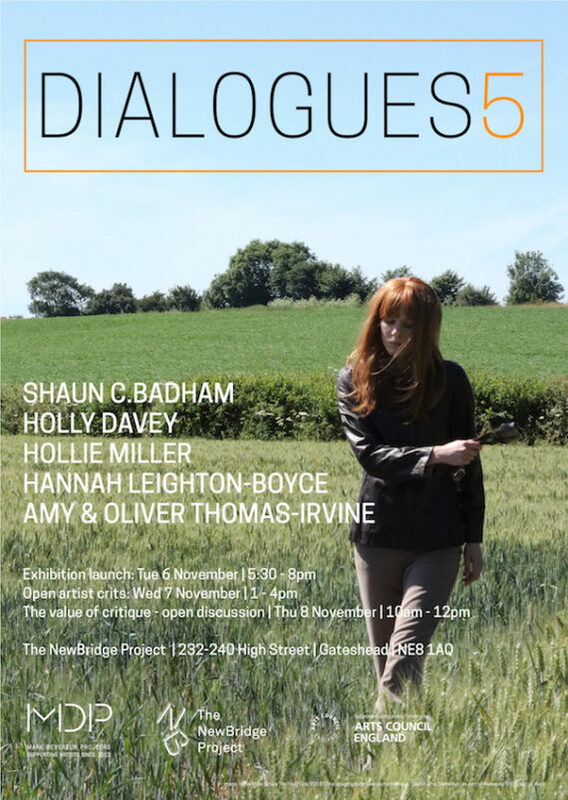 Dialogues 5 is supported by Arts Council England, Clayhill Arts and The NewBridge Project.